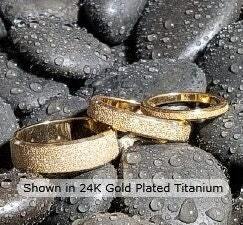 24K Gold Plated Titanium with precision Sand Blasting that gives an extraordinary diamond like sparkle! Wish I could post a video here of what it looks like as it shimmers under the sun or in lighting. Whether you are shopping to treat yourself to something nice or someone else, one thing more purchasing this ring does for you that others don't is that all bands are hand made here in the USA by a retired military vet who only wants to help others. Being financially fine in my retirement I do this to help with my overcome my PTSD, help make others happy and donate a large portion to the proceeds if not all to the Wounded Warrior Project charity to help our troops returning home who are in need of extended medical, physical and mental retraining. This helps pay for prosthetic, re-vocational training, mental health, financial assistance, and so much more so feel good about shopping here with PCR because you are making the world a better place. The couple disabled vets whom I employ separate from the WWP and I may no longer serve actively, but we at least found another way to serve as you can also. If you don't find what you are looking for, just let me know because I most certainly can make any type of custom ring you may want (excluding diamond and gem settings which I choose to leave the traditional stuff like that to big corp). - Extra thick 24K Gold Plating Finish! - Best gift for Birthday; Valentine's day; Friendship Gift; Mothers Day; Promise Ring, Birthday or Just Because. Would you like to personalize your ring?